Much to Zoulah's horror, last year after Halloween, the Red Couch Children ate Zoulah's home! This year, Zoulah forced the Red Couch Children to help decorate her home. It is very similar, structurally, to her last year's home, but the decorating is a tad bit different. You can see Zoulah's home from last year on the sidebar. 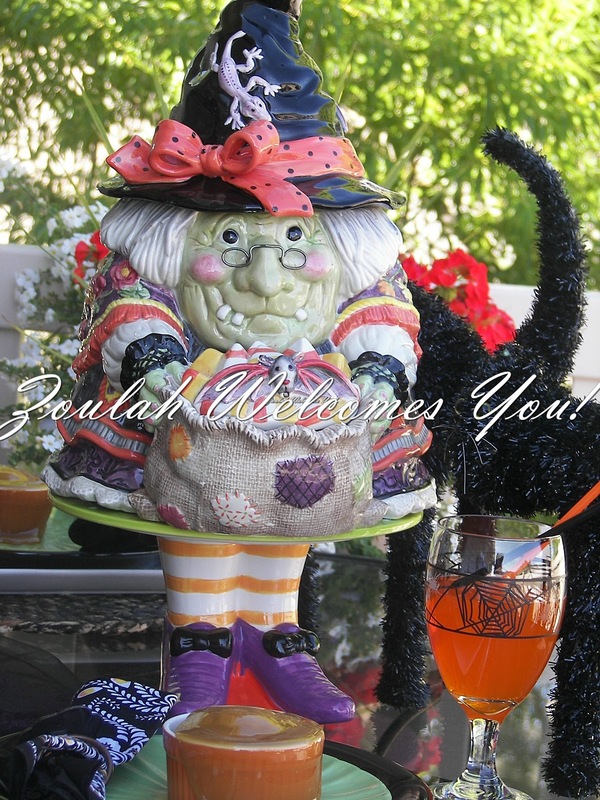 Zoulah welcomes you to the tour of her home. A frightening gooing eyeball greets you on the side of the home, as well as a scary green Frankenstein. 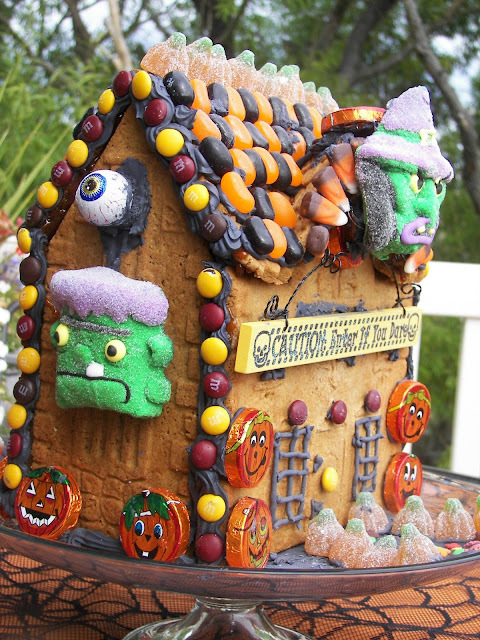 We have been making these gingerbread homes for years at Halloween and decorating the gingerbread home each year is a fun part of our Halloween celebration. The mold is a large John Wright metal mold that is available on E-Bay. We used royal icing for decorating and melted sugar to hold the home together. 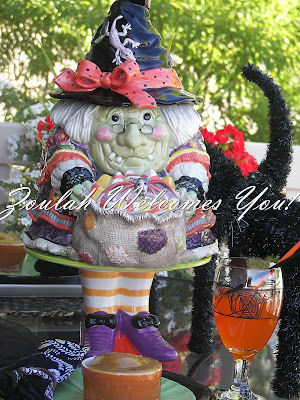 Zoulah thanks you for dropping by her home today. OMG flipping out over this!!! I can only bear to attempt on at Xmas and it isn't nearly as fab as this! Coolest thing I have seen in a long time. I love Zoulah's home! You decorated it beautifully, Joni!! Her house is amazing! You have so much talent! I really enjoy visiting your blog! Zoulah would have to cut my children's fingers off if she expected this to last through Halloween around here. 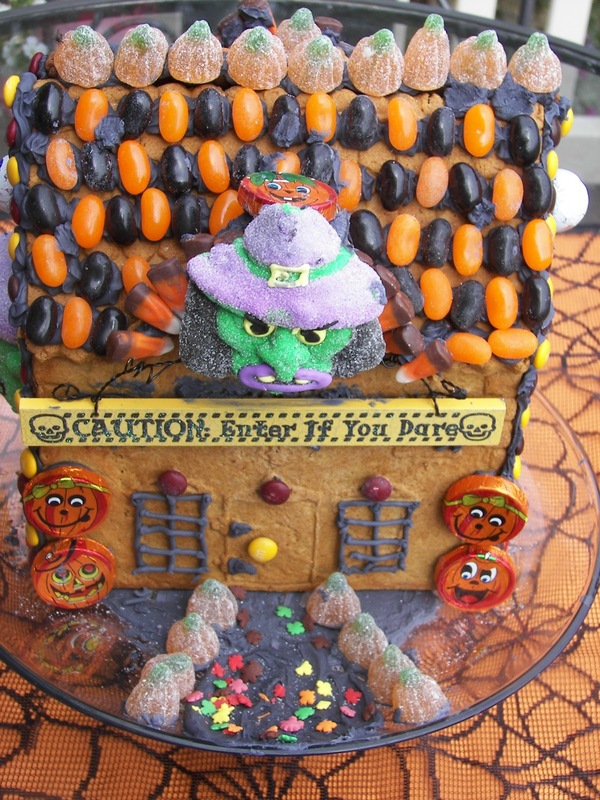 As a matter of fact, I want one of those sugary pumpkins on the roof. I hope Zoulah cannot cast long-distance spells. Too cute. My kids would flip for this. Much more fun than Christmas houses with all the wild colors and candy available now. I love it! Pure delight! This is what makes life long memories :-) GREAT job! Just perfect! 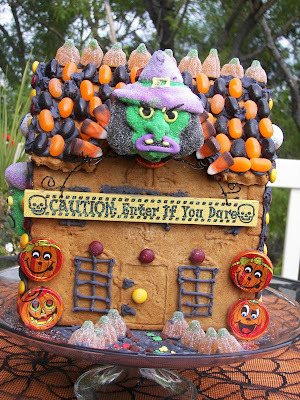 After all, the original idea of a gingerbread/candy house came from a witch's house. It makes perfect sense that Zoulah would live in one too. Yours is quite the masterpiece! Your house is a masterpiece, Joni. The kids eating last year's model is a good excuse to make another one. I love activities like this that everybody can take a part in. Zoulah has some pretty fancy digs if you ask me! I hope Zoulah is enjoying her beautiful, new home! It is gorgeous!